A refreshing, accommodating and relaxing environment for retreats, workshops and conferences in the Catskills only a couple of hours from NYC…but over a million miles away. 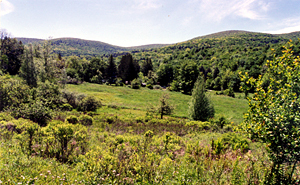 Nestled in the midst of over 80,000 acres of Catskills wilderness preserve, just west of the Hudson Valley, is a one hundred acre wonderland of mountains, fields and streams -a world of its own. This turn of the century, year-round mountain resort, is the perfect setting for all types of Catskill Mountain retreats, workshops, conferences, group gatherings and reunions. For over seventeen years, Full Moon Resort has hosted a broad spectrum of artistic, educational, corporate, recreational and cultural groups – with the common thread being special attention to each diverse group’s particular needs. At Full Moon, the key word is “connecting” – with others in the group, with nature and with oneself. Whether attending a serene, uplifting meditative retreat, a bonding company experience (including the work and business! ), or an educational or artistic workshop, the connections simply happen. 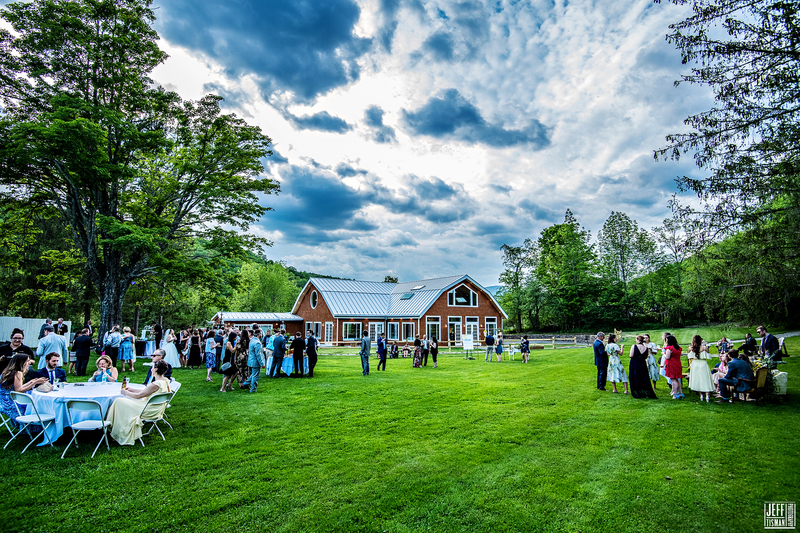 Full Moon Resort offers charming, classic country inn accommodations and custom designed group dining on a rolling Catskills farm surrounded by mountain peaks, set within a Woodstock-inspired artistic environment. This unique combination provides a backdrop for a remarkably special experience for participants at conferences, retreats and workshops of all types. Located in the heart of the Catskill Mountains, a short Hudson Valley ride up the Thruway (only two and half hours from New York City and environs), Full Moon is an alternative to more traditional country inns and resorts - with educational, recreational and artistic workshops, weekend long weddings, and art exhibits all part of its magical landscape. The Café’s New American cuisine features the finest traditional dishes, enhanced with natural, organic ingredients whenever possible and superb vegetarian options. Guests enjoy a smoke-free indoor environment throughout the entire facility. The accommodations are charming in their simplicity, with campgrounds available as well. Acres of fields, meadows, forests and streams provide a perfect backdrop for both group and personal retreat, away from the stress of day to day life. The environment is conducive to both relaxation and focus – simultaneously. 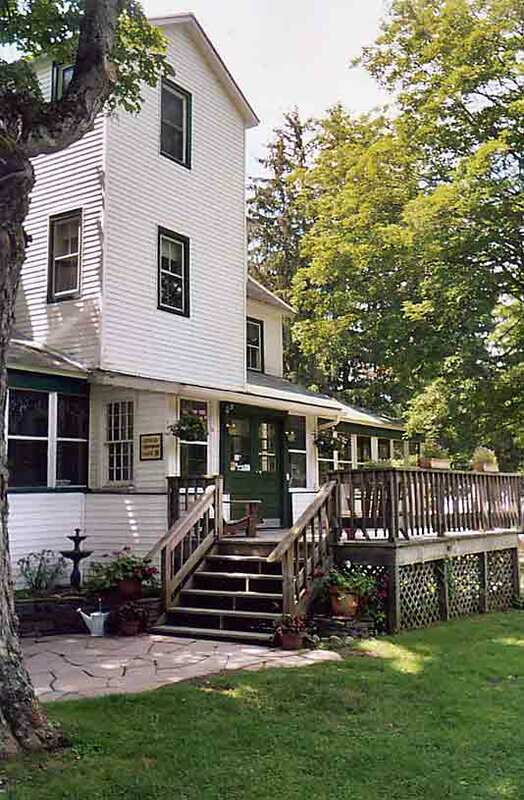 The centerpiece of Full Moon, a turn-of-the-century Catskill country inn known as the Valley View House, features simple, affordable B&B style guest-rooms, a wrap-around sun porch, lobby, library and dining room / café. Surrounded by works of original art in the hotel lobby and library, guests relax on comfortable couches and enjoy the peacefulness of the country. A number of additional guest houses accompany the Inn. For guests interested in being closer to Mother Nature, during the warm weather months, tent camping on the fields and meadows is an option. For “luxury camping” the facility features a circular Yurt bordering the Esopus Creek. Restrooms with showers and changing rooms are provided for campers. Immersed in nature, with the Catskill high peaks rising all around, the natural beauty of the valley is quietly breathtaking. Wildlife abounds. The crystal clear waters of the Esopus Creek gently carve through ancient, moss-covered rocks. The air is so sweet and pure, you can practically taste it. Full Moon is a showplace for the seasons. In the spring, apple blossoms and songbirds herald rebirth and awakening. On long, warm summer days relax and cool off at the spring-fed pool. In autumn, the hills are on fire with color; and, in winter, blankets of snow on rolling fields are just right for cross-country skiing and snowshoeing. Just up the road are three state trailheads. Giant Ledge Trail carries hikers to one of the most scenic vistas in all of upstate New York. 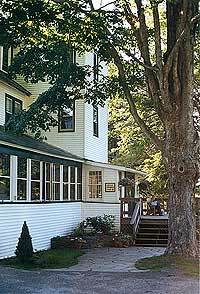 The resort is ideally suited for workshops, conferences, retreats and reunions in the heart of the Catskills. Featuring the Moondance Pavilion, ideal for group conferences year-round, Full Moon Resort is an ideal alternative to more traditional upstate, Hudson Valley and Catskill Mountains conference centers. Two additional buildings, the highly adaptable Roadhouse and the Barn (each described in detail below) can house seminars and lectures, classes and a variety of other functions. Common areas at the hotel and lodges work well for smaller groups. The special needs of every client are given highest priority. Full Moon offers the personal and individual attention needed to insure a successful and smooth running event. Retreats, conferences and workshops are custom designed for groups of all sizes. Along with accommodations and dining, if the client so desires, the facility can provide special catering (from hors d’oeuvres to full parties), special equipment set ups, music booking and a spectrum of diverse services. With refinished wood floors, a large, carpeted loft, and giant picture windows wrapping its perimeter, with beautiful mountain views, the Barn is a perfect setting for lectures, films, slide shows and power point (screen available.) Also a wonderful venue for acoustic performances and classes. Fully heated and available year round. 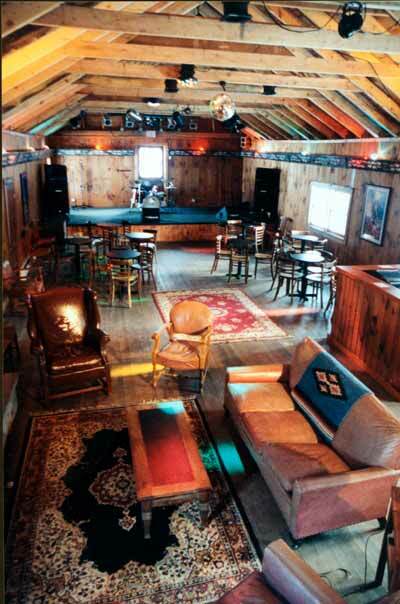 This fully heated facility features a stone fireplace, refinished hardwood floors, barnwood walls, an elevated stage, a full 24 channel PA system readily adaptable to ipod or cd’s, and a full theatrical lighting system to help create the ambiance you desire. The main function room is 24 feet wide by 54 feet long, offering up to 1,300 square feet of space, and is highly adaptable to parties, lectures, seminars, conferences, movement, yoga or meditation. A separate room houses a full bar and additional seating. Perfect for classes, talks and social gatherings, the artistically rustic Café features exhibits by regional artists and a small corner stage for lectures or performances and a buffet area. 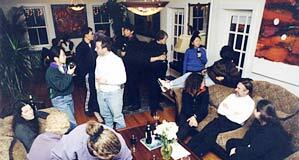 Some of Full Moon's cottages feature a living room adaptable for small breakaway groups, meetings or classes. 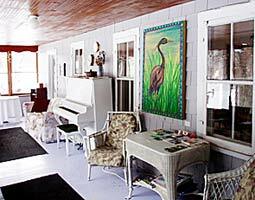 The lobby area of the Inn, offers three comfortable spaces with living room furniture, TV with DVD/VCR, ipod compatible stereo system, antiques, plants, lighting and colorful works of regional artists. Full Moon is an easy and enjoyable 2.5 hour drive from the New York City area to the heart of the Catskills Forest Preserve. Trailways buses from Port Authority stop 5 miles down the road in Big Indian. Round-trip bus tickets cost approximately $60.00. per person. Contact Ray Nicolas at 845-688-7350 to make arrangements. Arrangements can also be made with this company and others for local transportation for your group to and from regional sites of interest. Please note that Full Moon Resort is not affiliated in any way with this or other transportation companies. 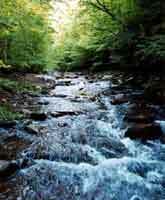 Full Moon is ideally located for year round outdoor group activities in the Catskills, just west of the Hudson Valley. Please note that Full Moon Resort does not provide, supervise or sponsor these activities, and is not, in any way affiliated with these or other companies who do. All contacts must be made directly by the Client. Contact Craig Appolito at 254-9888. Hikes are custom designed to suit your group’s experience and needs. 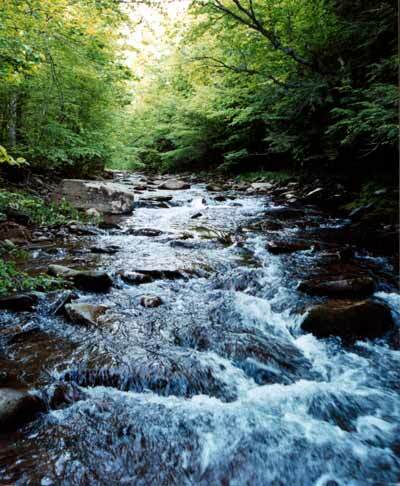 Hiking - Discover the majestic Catskill Mountains on foot as you learn about the wildlife and the forest, natural history and local legends. Easy to moderate hikes ranging form 1-8 miles and 2-5 hours. Or, moderate to strenuous hikes ranging from 4-8 miles and 3-6 hours. Hiking boots, daypack, lunch, and versatile outdoor wear are needed. Night Hikes - Frolic under the star filled skies as we hike over easy terrain experiencing nature nocturnal style. We will use other senses to navigate through the woods.1 to 2 Miles, and 2 hours. Photo Op Hikes - A photographer will lead you on a hike with views, natural beauty, and wildlife. He will show you how to use different functions of your camera, lighting, nature vs. people pictures, and how and what makes a good photo. Snoeshoeing - Trek along the winter wonderland on a set of snowshoes while experiencing the forest with its winter blanket. Listen to the silence of winter. 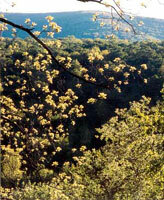 Without leaves on the trees you can enjoy views that can't be experienced any other season. Snowshoes included. You will need a daypack, waterproof hiking boots, lunch, and cold weather clothing. Remember you need to dress in layers! 2-5 Miles, 2-6 Hour duration. Last Rentals at 4:00 p.m. 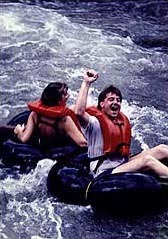 If you've never tubed before, head for the Town Tinker Tube Rental headquarters on Bridge St. in Phoenicia, NY. There, the expertly trained Town Tinker staff will rent you all the equipment you need, as well as giving you tubing instructions and safety tips. Town Tinker has two tubing courses, novice and expert. As the name implies, the novice course is for first-time tubers and those who prefer a gentler ride down the creek; the expert course is for more experienced tubers. Each course is about 2 1/2 miles long and each takes about 2 hours. At the end of the course, either our Town Tinker Tube Taxis (weekdays) or the Catskill Mountain Railroad (weekends and holidays) will be your transportation back to Bridge St.
Just 4 miles from Full Moon, experience some of the best cross-country skiing New York State has to offer! Set on 6,000 acres deep in the Catskill Mountains, Frost Valley YMCA offers great skiing for all ages and abilities. Whether it's the miles of beautiful backcountry trails, or skiing beside pristine streams, there's something for everyone! Waxless skis with step-in bindings.